The best made plans don’t always work out (as planned). One example was my plan to serve Butternut Bisque in small cups as an appetizer prior to our Thanksgiving meal. The guests arrived late, the dinner was ready too soon, etc, etc, etc. So to stave off the hungers while I got the last minute details ready, I quickly put together this appetizer that I have had at other peoples’ homes but never made myself. No problem, it’s so easy you don’t really need a recipe, and everyone seems to like it. The only real requirement is a piece or wheel of brie cheese. Everything else can be a mix and match with whatever you have on hand. A mini wheel of Brie–about 8 ounces. I used only half a wheel to make a small amount. 2-3 Tablespoons of jam. 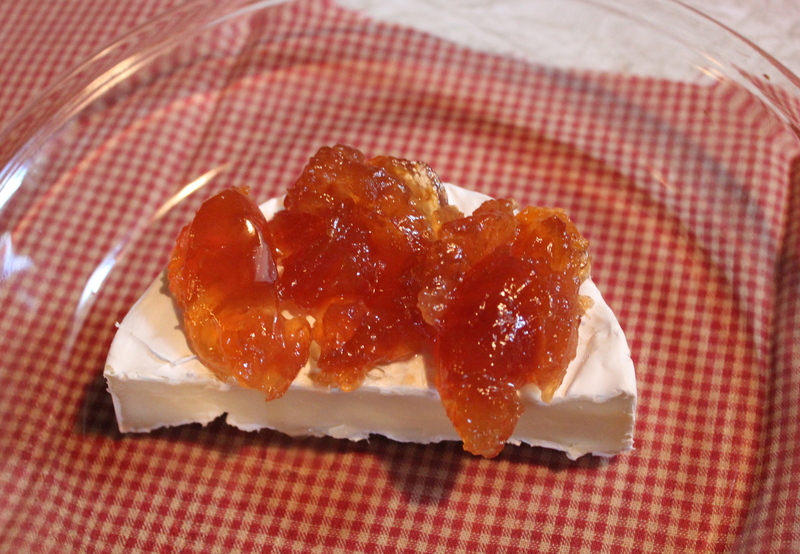 Apricot is a good match with Brie, also Fig jam is good. 2 Tablespoons chopped pecans or other nuts of choice. 1 -2 Granny Smith apples, cored and thinly sliced into wedges. small crackers, whole grain or nut crisps work well. 1. Place Brie into a small, greased oven proof dish. Spoon jam on top. Brie in a baking dish with jam spooned on top, ready to be baked. Bake in a 350 degrees oven about 10-15 minutes, until cheese is oozy and jam is melting. Remove from oven. Sprinkle nuts over the top. 2. 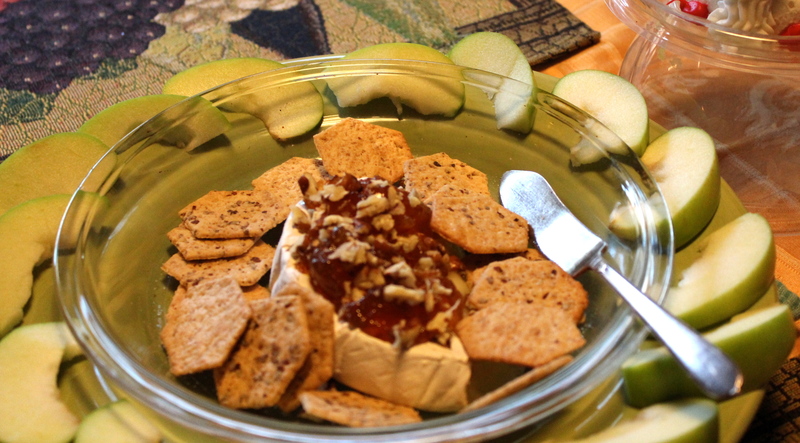 Place the cheese dish on a larger plate or tray and arrange crackers and apple wedges around it. 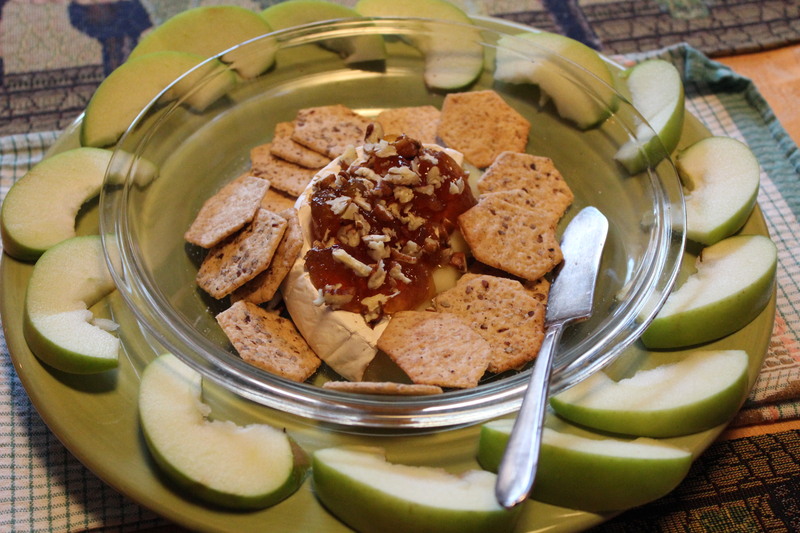 To eat just dip the apples and/or crackers into the cheese mixture and enjoy.